Direct - Folder Lock 7.7.5 Final Multilingual Incl Keys | Team OS : Your Only Destination To Custom OS !! is fast file-security software that can password-protect, lock, hide, and encrypt any number of files, folders, drives, pictures, and documents in seconds. Locked files are undeletable, unrenamable, unmovable, hidden, and inaccessible. You can lock, scramble, or encrypt depending on speed and security. is fully portable, so you can protect your files on USB flash drives, disks, CD-RWs, notebooks, and hard disks, and it doesn't require installation on another PC. Folder Lock protects files in Windows, DOS, and Safe modes, even when you change your OS or boot from a disk. Folder Lock doesn't let you delete its own program folder, and it can't be uninstalled without the correct password. Additional options include Stealth Mode, Hacker Attempt Monitoring, Shred files, AutoLock, Auto Shutdown PC, Lock your PC, Erase PC tracks, 256-bit Blowfish Encryption and Context Menu in Explorer. With Folder Lock you can now encrypt your files faster than ever. The program creates Lockers, without taking up much space and grow as you dump files in it. Lockers are encrypted, resizable, portable and ready for backup. Folder Lock 7 allows you to optionally backup all files and folders you keep in your encrypted Lockers automatically while you continue to modify or access your encrypted files. Files remain encrypted at both ends. Users can now achieve true portable security, application level password security, activate stealth options, shred files, make wallets, clean history, auto protect the application and all its files, use virtual keyboard to type passwords to prevent key logging of any kind and can prevent hacking and incorrect password attempts. 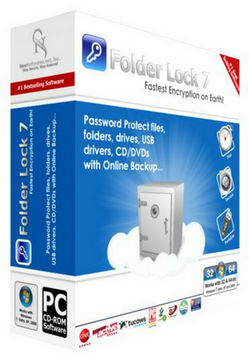 Folder Lock 7 leverages NewSoftware's highly regarded graphical user interface. It's the same great console they already know and love. 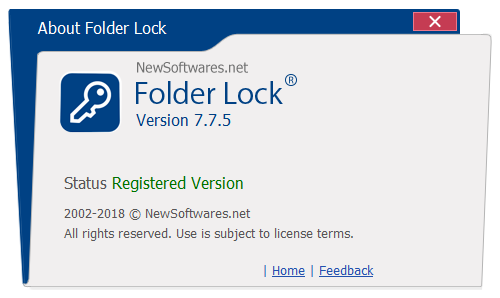 New users will find Folder Lock 7 remarkably easy to configure and use. Even relative novices can use all features of the product without going through all the jargon and how tos. can u update to 7.7.6? Thanks for the upload. This also works with the latest version (folder lock 7.7.8). But is there any upload for Renee file protector? It seems to rival folder lock. If there is, link please. Thanks!